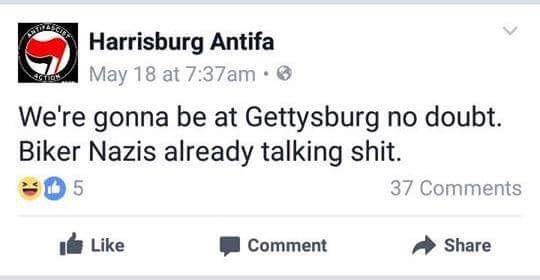 “ANTIFA” are planning on holding a rally at Gettysburg National Battlefield on July 1st, asks it’s members to “Bring and Burn Confederate Flags”. Over the past few weeks, several US cities have been a hotbed of controversy over the removal of several Confederate monuments. After decades standing sentinel over New Orleans, the last of four Confederate monuments have been removed after being labeled as “Monuments of Racism and Hate”. New Orleans Mayor Mitch Landrieu said of the removal of his city’s monuments: “To literally put the Confederacy on a pedestal in our more prominent places—in honor—is an inaccurate recitation of our full past, is an affront to our present and it is a bad prescription for our future”. The next state to follow in the footsteps in the movement is Arizona, where leaders call for the swift removal of six Confederate monuments around the state. Most recently, “Antifa” protesters in Texas have demanded the removal of a 100-year-old statue and “any other landmark that bears the name of Sam Houston”. Houston, one of the founders of Texas, was a staunch Unionist and denounced the creation of the Confederacy. But Houston owned slaves, so he’s been added to the purge list, which now includes: Andrew Jackson, Thomas Jefferson, James Madison, and Woodrow Wilson, among many others. Susan Platt, a candidate for Lieutenant Governor of Virginia, called for the Commonwealth to take down Confederate monuments and rename Confederate-themed highways and public buildings. In her political announcement, she states “I don’t believe it is right to celebrate an act of treason against the United States of America, a war that was waged for the purpose of maintaining slavery”. In an online video, Right Wing News stated that the “City of Baltimore wants to follow in New Orleans footsteps and remove several Confederate monuments”; including monuments to General Thomas “Stonewall” Jackson and ones to soldiers, sailors, and women. Many have asked, “How long til this moves North?” To answer that question, the statue of a former mayor, Orville Hubbard, was removed from the front of the old City Hall building in Dearborn, Michigan and spent 17 months in storage before being placed on the lawn of the Dearborn Historical Museum. Beyond his name and dates of service, the statue’s new site will not provide any information about Hubbard and his views that made Dearborn “a symbol of the deep-seated racism of the North,” the New York Times said in 1969. A local group of self-proclaimed anti-fascism activists called “ANTIFA” are planning on holding a rally at Gettysburg National Battlefield on July 1st in protest of President Trump and asks it’s members to “Bring and Burn Confederate Flags”. The reasoning behind why this group picked the date and location for their rally is for the importance Gettysburg played in the American Civil War. The Battle of Gettysburg started on July 1, 1863, when Lee’s Army of Northern Virginia met General George Meade’s Union Army of the Potomac. During the three-day battle, about 165,000 soldiers clashed in and around the small town of Gettysburg. When the Battle of Gettysburg was over on July 3, 1863, 51,000 soldiers were casualties (killed, wounded, captured or missing) in what remains the largest battle ever fought in North America. There are approximately 1,328 monuments, markers and memorials that stand in both the cemetery and battlefield to commemorate the Union and Confederate troops who fought there. In removing any monument or marker of history, to what purpose does that serve? History in every corner of the world while oftentimes ugly and heinous, still serves a purpose. It is a remembrance to learning from our past and not condemning ourselves to repeat it. To some, it is a heritage that we tell future generations of who they are, where they come from and our American history is not a stumbling block but a stepping stone to a better future.